Rule Number One when encountering a strangely-packaged tin of pu'ercha is usually: run a mile. In the case of that tin containing small tuocha or, in this case, little squares of tea, the advice should be: run two miles. However, you would be doing yourself a disservice if you did not keep an open mind in this instance, because, as we shall see, this pu'ercha that looks so stereotypically dreadful turns out to be really rather good. 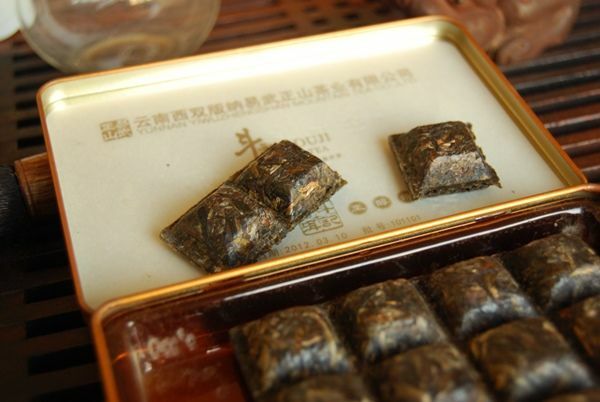 The little "chocolate cubes" come apart with a snap, and the tiny leaves give no hint, in either appearance or scent, as to the final result. Interestingly, I wonder if Douji has a significant market elsewhere in Asia - as shown below, one half of the text is in what appears to be another script. The bricks are a 5x3 matrix, each weighing 6g, giving a total of 90g in the Xiaojinzhuan [little golden brick]. 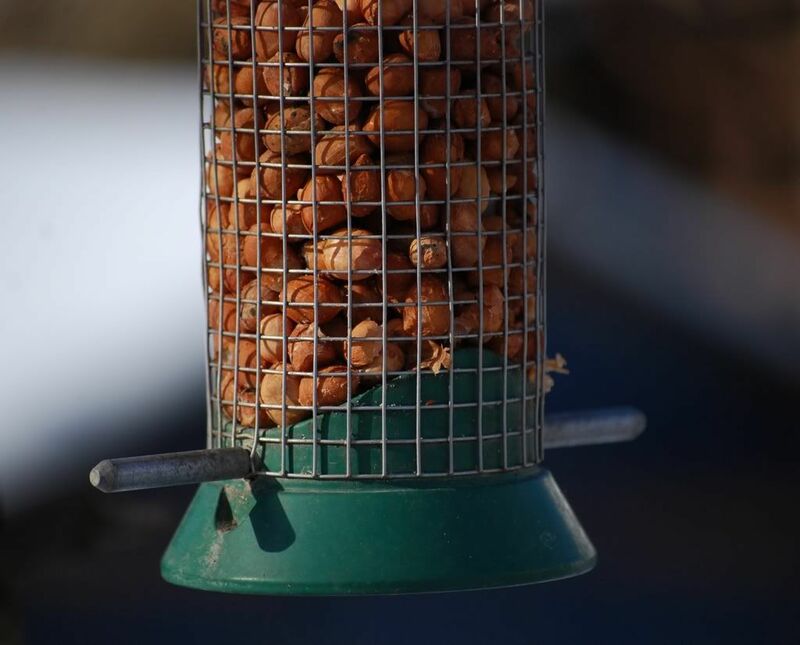 Unlike most "nibbles", such as the usually-grim mini-tuocha or mini-bricks mentioned before, these do give off a clean, sweet scent once they have sat in the air for a little while. 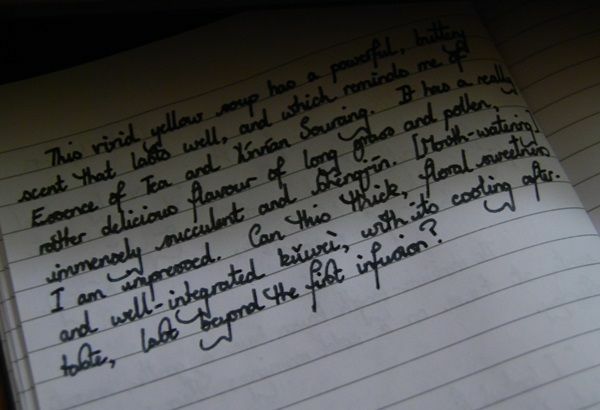 "It smells like real tea", I have in my journal. 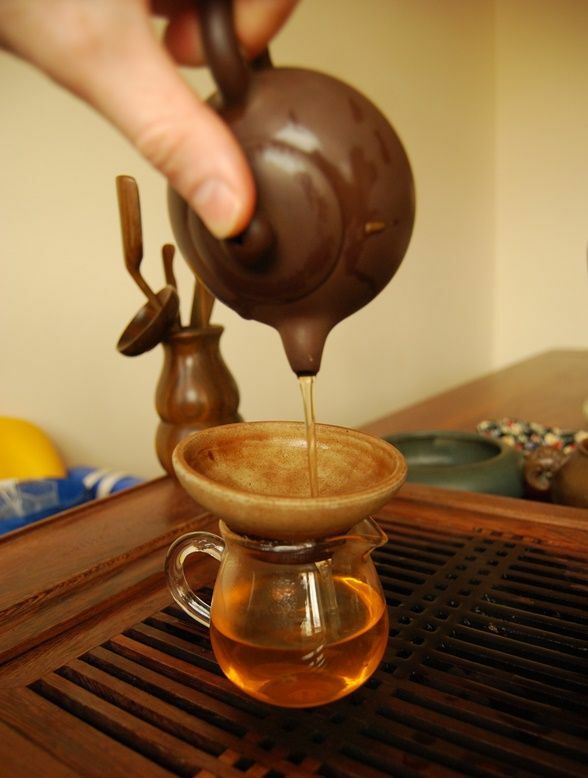 Likewise, the wenxiangbei [aroma cup] has the warm scent of real pu'ercha, which is something of a pleasant surprise. 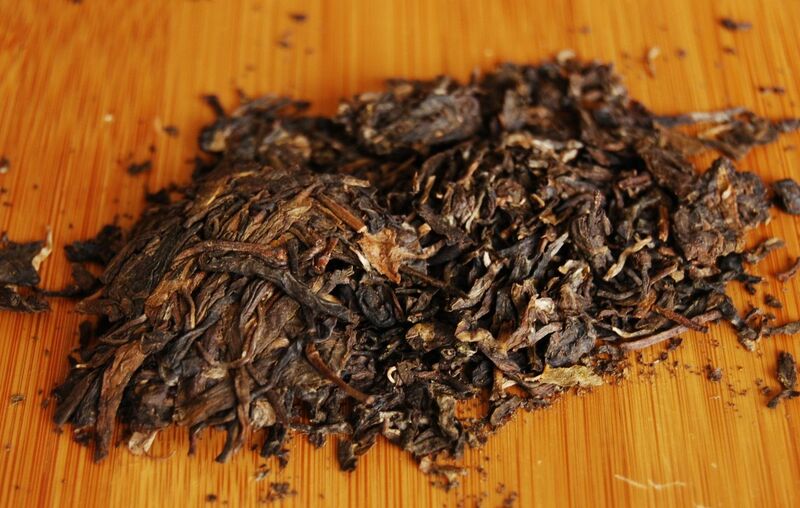 My previous experience with "convenience pu'ercha" of this kind has been of the grass cuttings and plantation variety. I expect the first infusion to be underpowered, due to the tight compression which causes the leaves to take a few brews to separate. However, it is good right from the off: the soup is yellow (turning orange in the air, as pictured above), and the brew is penetrating, sweet, and surprisingly cooling. 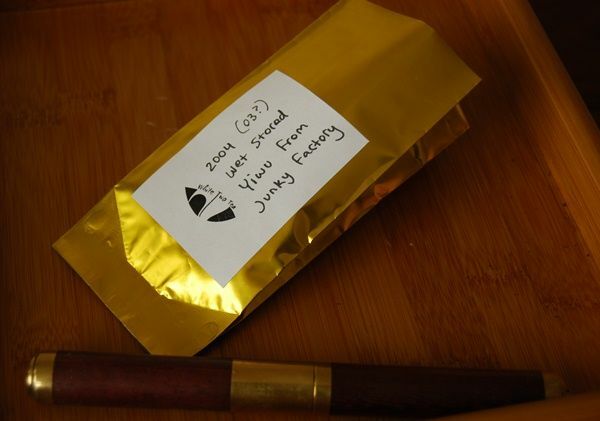 Jerry was kind enough to send me this little box on its own, in a package after a recent batch of Douji samples that he knows I usually enjoy. 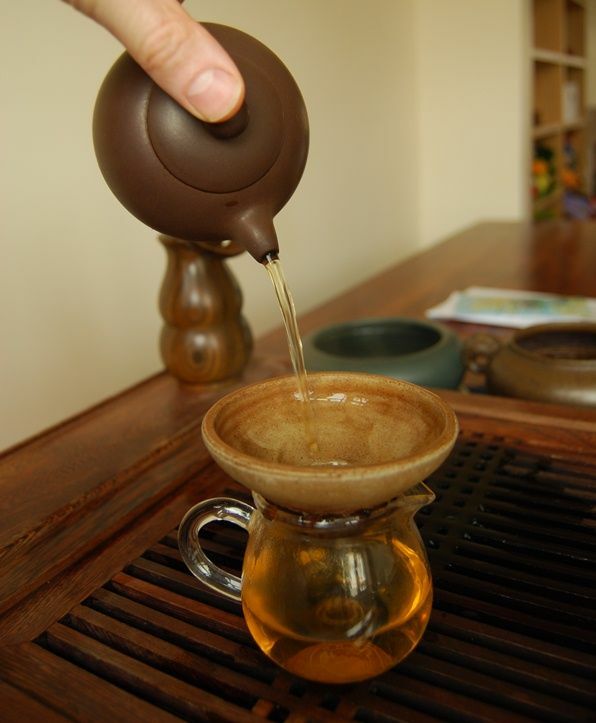 The quality of this convenience tea really rather took me by surprise: it is lively, vivid, creamy (in the manner of many Douji blends), and worthwhile. 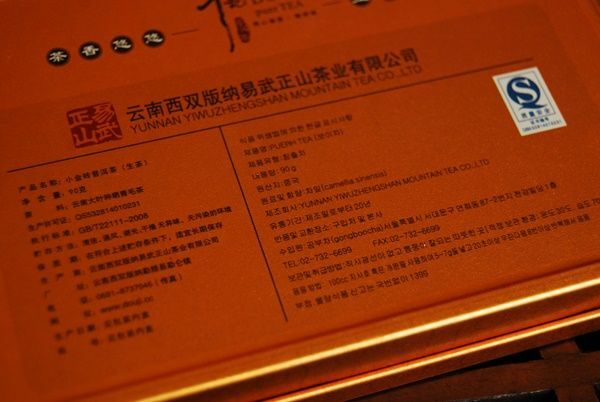 This looks like a tea that was born to travel, and perhaps I shall take it on my forthcoming round of academic visits. 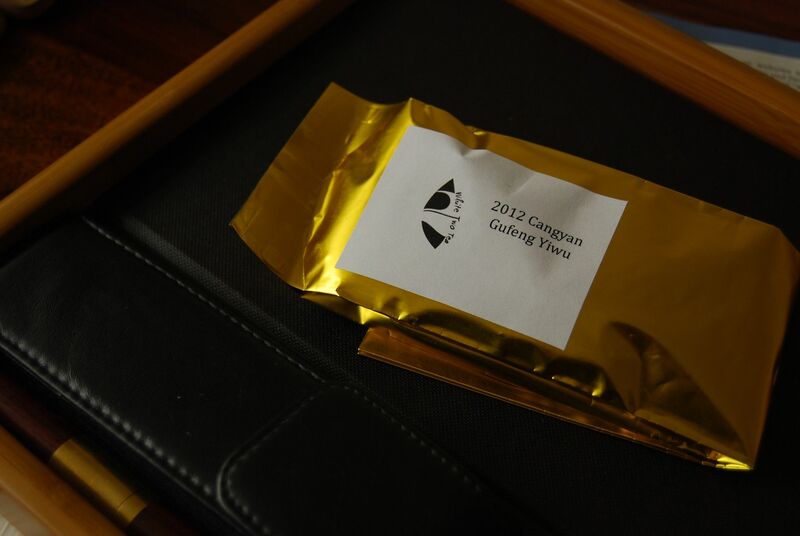 2013 seems to have a grim mixture of Paris, Beijing, Qatar, Osaka, and Brunei lined up, and so I suspect this Little Gold Brick will be as exhausted as I will be at the end of it. Sometimes it's OK to fake a cake. Or, rather, sometimes the fakes turn out to be OK.
We need to keep an open mind. This is a highly inexpensive cake, sold by Captain Ahab. It costs around fifteen American dollars, which ain't, as I believe it is said, no thang [sic]. 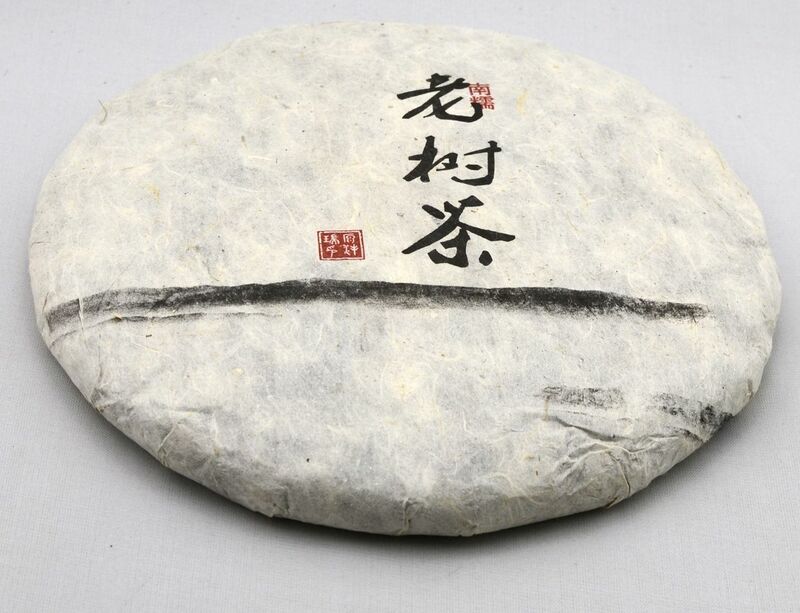 We must rapidly leave behind the notion that this is a Menghai Factory production, and consider merely as some sort of pu'ercha, wrapped in a Menghai wrapper. The leaves, pictured above, are medium-sized affairs. The neifei, pictured below, is even embedded within the cake, and looks like an actual Menghai piece. However, brushing all that nonsense aside, we are left with that eternal battle: man vs. leaf. 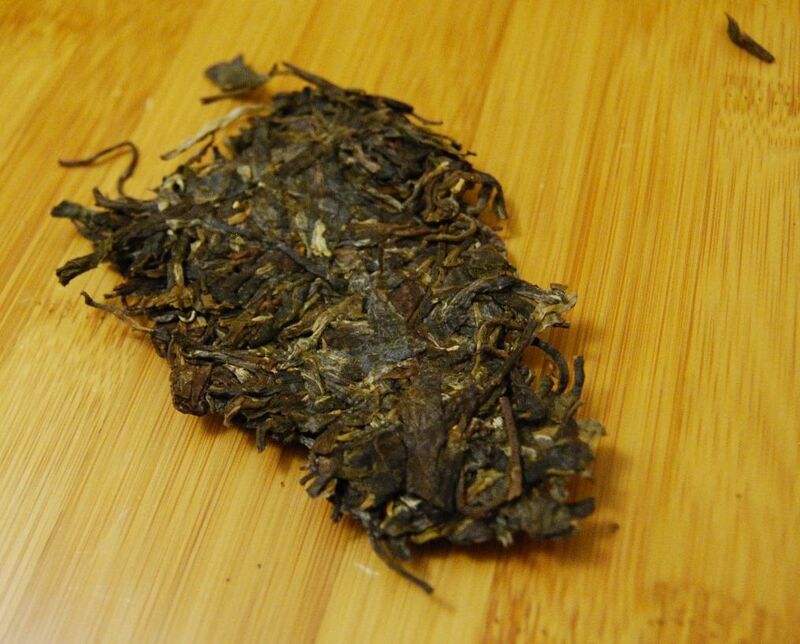 I am immediately impressed by a robust huigan and its slightly cooling finish. "Chunky, powerful, and quite decent", I wrote in my journal. I must have liked it, too, because I have a cake or two in my collection. Its solid sweetness is very 'Banna, and I enjoy it. 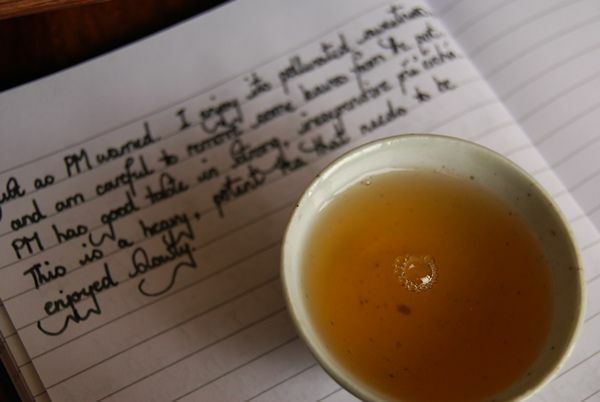 The strong, clean, orange soup lasts well throughout the infusions, and shows no signs of dodginess or slyness in production. 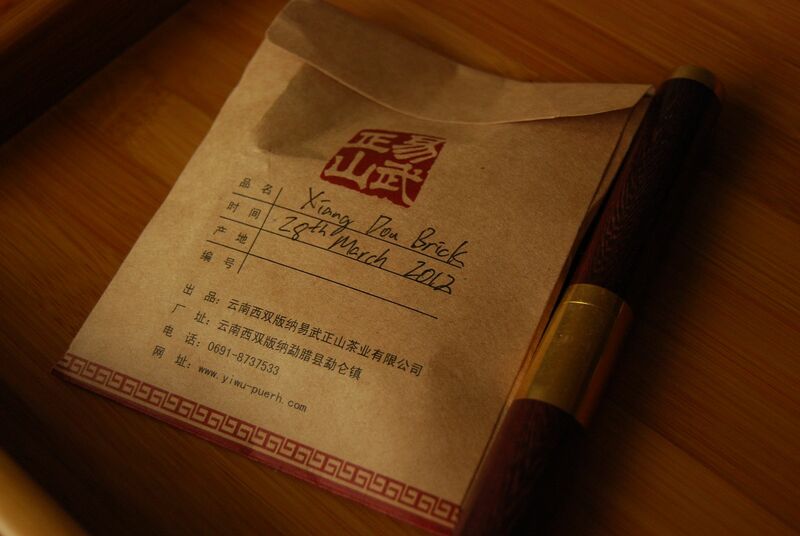 Rather, this is a basic, powerful, and thoroughly enjoyable cake that has been dressed up to look like Menghai. If you like raw, rampant bargains, then this cake will immediately appeal to you. 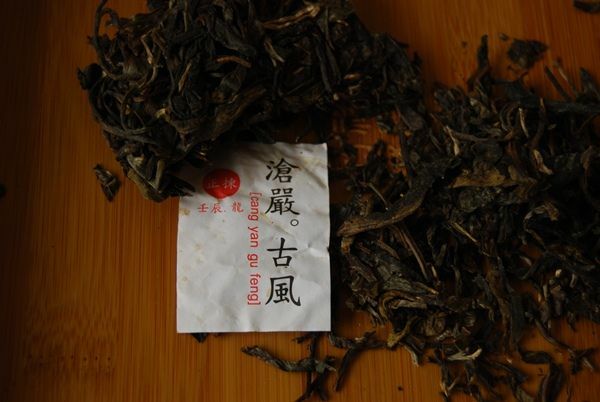 I am very happy to discovered this little gem, which is to say, I am very glad that PM of white2tea discovered this little gem and decided to stock it. The aging profile is fine, and I can see this getting even slightly better in coming years, due to its chunky, uncompromising centre that carries it well. Fake or no, for the equivalent of £10, I am laughing all the way to the pu'ercha shelves. For the truly curious, updates have been made to 2009 Yunzhiyuan "Guafengzhai", which is aging very nicely. 5 a.m., and the snow has fallen. 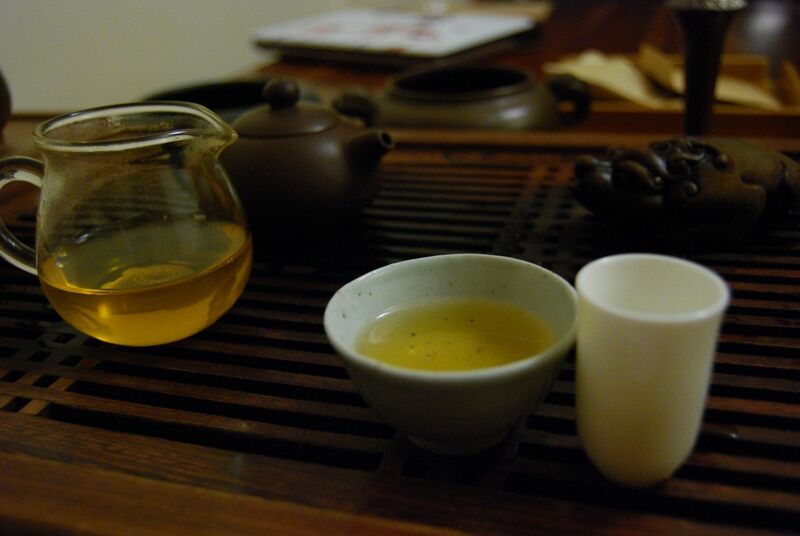 Every now and again, a tea-session makes its way into my working week, due to an unusually early start. 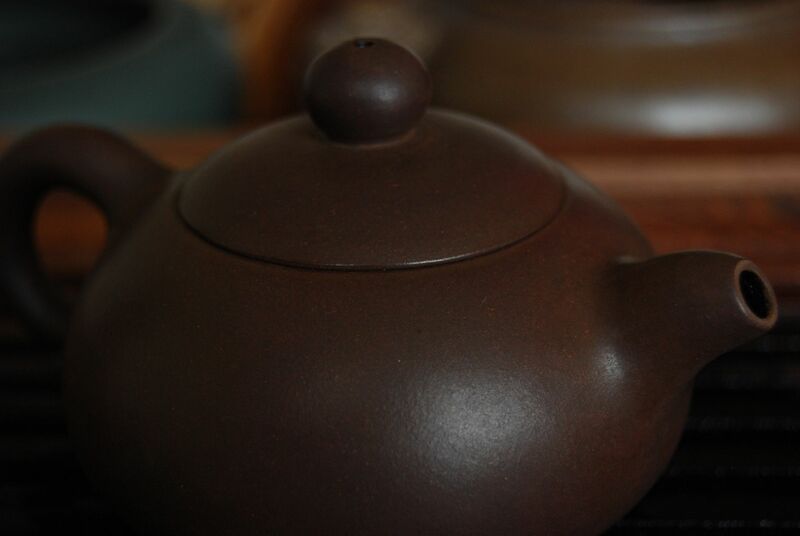 Xiaohu will wake in an hour or two, which is time enough to get the kettle working. The only other Shangdou I have in my archives is a version from 2008. Back when (correct me if I'm wrong) they were something of a novelty. I don't recall seeing them before 2008, at least. 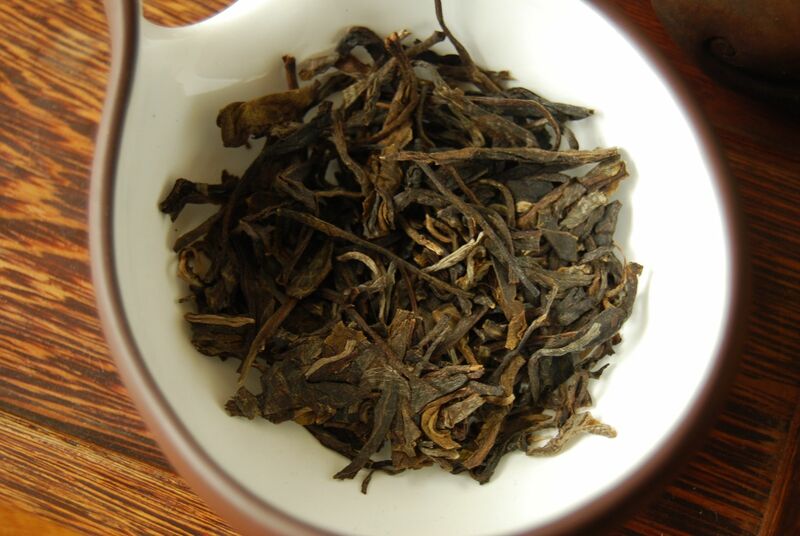 Of course, since then, the Douji catalogue has made the Shangdou one of its regular blends. As with much of my Douji, this sample comes from Big Jerry, over at China Chadao. 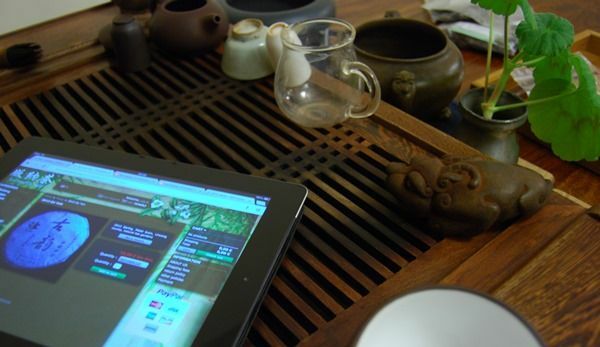 I think his (physical bricks-and-mortar) teashop is a franchise of Douji, but I might be wrong. It certainly seems to be a blend, in comparison to the homogeneity of the company's more expensive "single mountain" cakes. 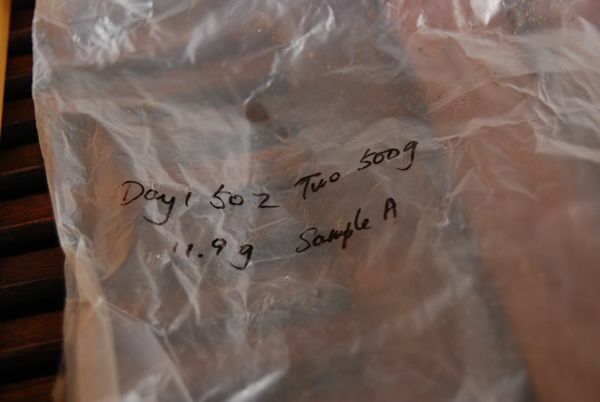 Pictured above, the tight little cake is a mixture of small fragments - the result, though, is glossy and pleasant. 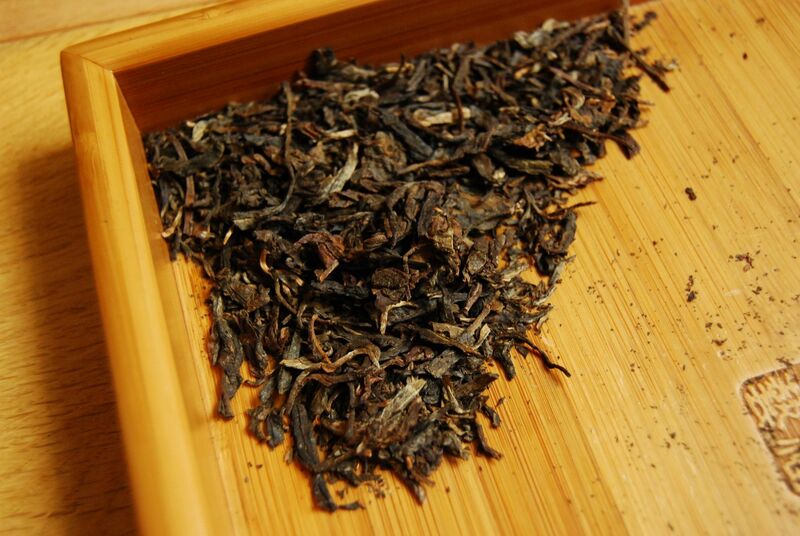 Even after the snow, at 5 a.m., the leaves exude the gentle candy-like sweetness of Douji blends. 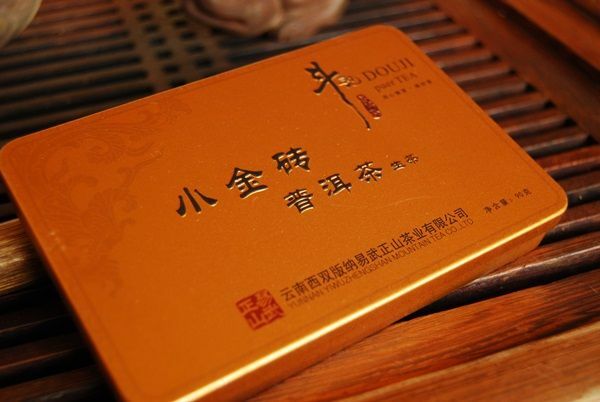 Douji blends are good "early morning cakes": I wouldn't want my still-slumbering tastebuds to encounter anything too subtle or gradual at such an hour, and the Douji Shangdou is certainly neither subtle nor gradual. 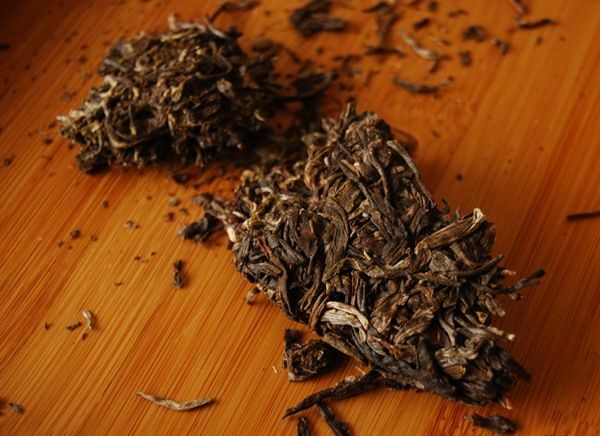 Perculiar to most Douji blends is the husky (but not roasted) sweetness of raw pu'ercha leaves, put through whichever process Douji uses that results in such a characteristic. 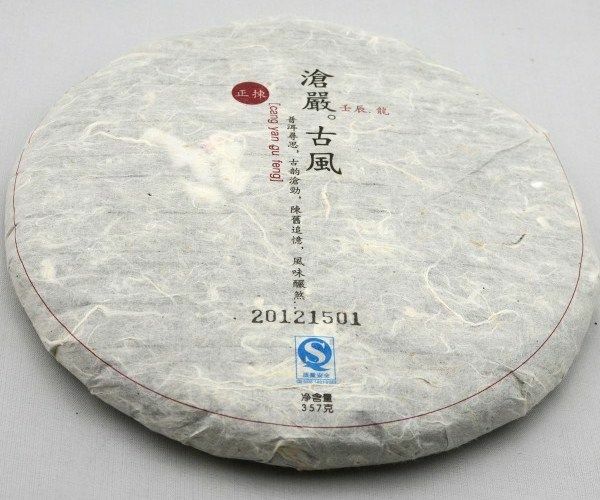 Once hot water is added, the scent takes off, delivering a huge lengxiang [cold scent] of sticky, solid candy. 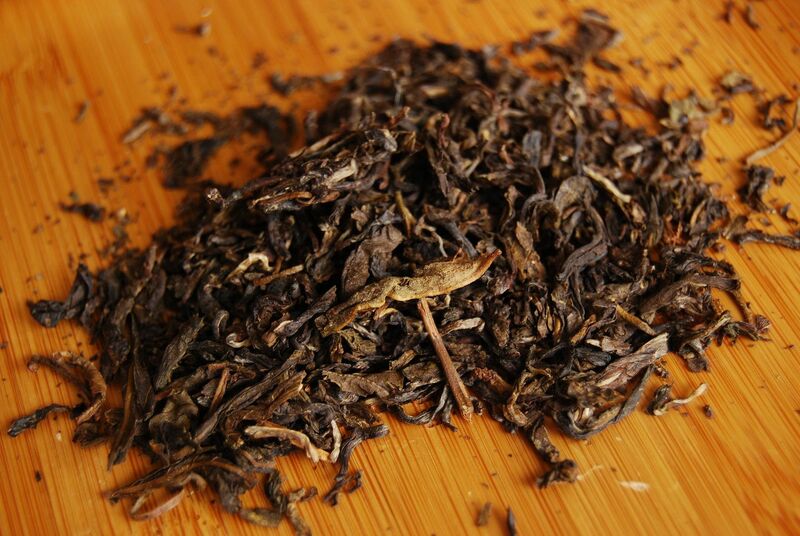 This blend is plenty of lo-fi fun: it is bitter, sweet, and enjoyably cereal-like, for those that like a little "outer region" flavour to their cake. 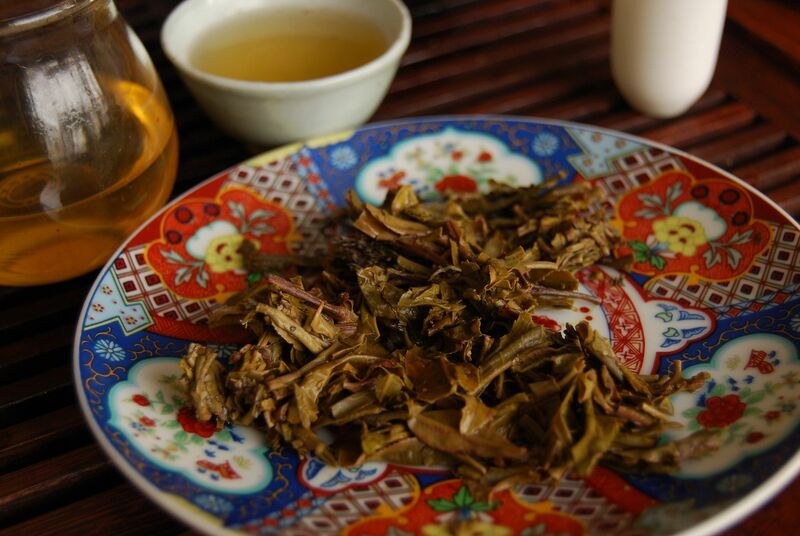 After three or four infusions, it swells to its maximum potency, and tastes very Lincang or Simao. Indeed, checking the blend contents, it seems that this cake includes Menghai, Mengku (Lincang), and Simao. On a cold winter morning, a rugged and stable little kicker such as this is very welcome. It is not complex, but that stable base of cereal strength is plentifully fun. 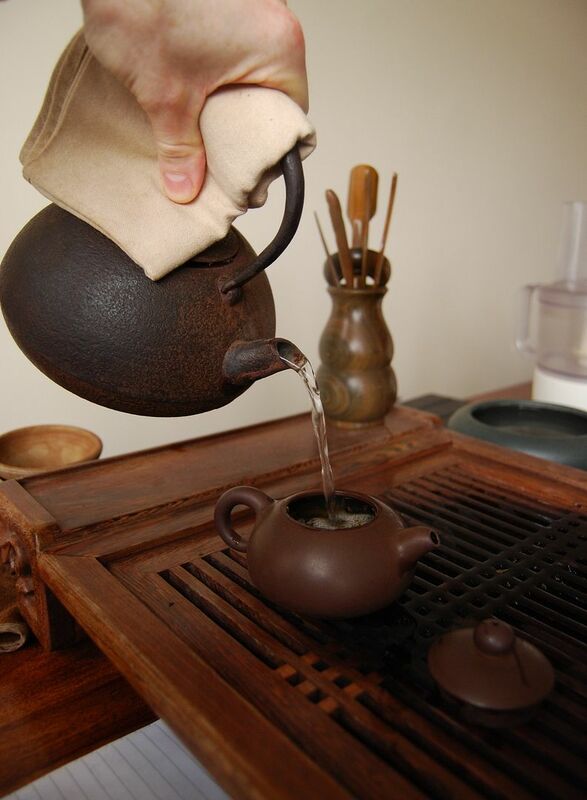 Changing gear, I head into the Xiangdou [fragrant Dou]. I haven't tried this one since 2009. This is tippy and, would you believe it?, highly fragrant. The clue, as always, is in the name. The blend contains, I later discover, Bulang, Menghai, and a mystery third location. 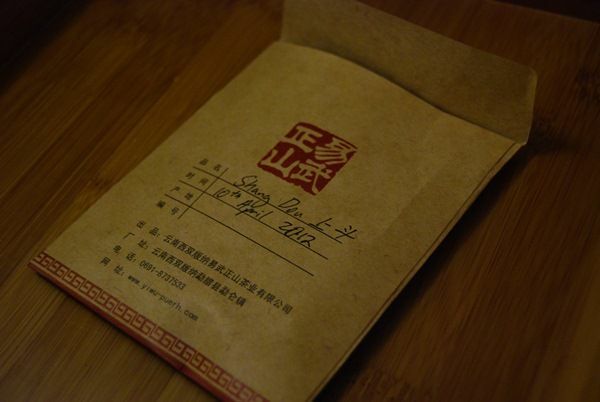 This is big, buttery, and sweet: "xiang" indeed. While it carries the Douji signature of low tobacco, this also contains a variety of floral tones, which is quite unusual for this brand. Sweet cereal, shengjin [mouth-watering]: it is, as with the Shangdou, stable and enjoyable. Tangy in kuwei [good bitterness], this has plenty to enjoy. I am eternally beholden to solid plantation blends, because they remind me of my eternal favourite, the solid old Menghai classics. Douji fits the bill. Be warned accordingly, if you do not prefer this genre. The sun is not yet risen, nor my son. Perhaps there's time for another infusion. 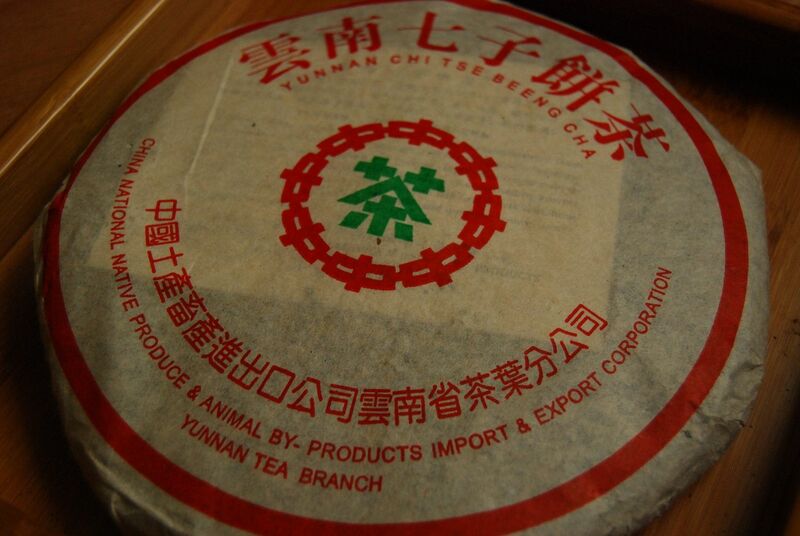 This is a fascinating cake, and already "checks all the right boxes": it was made by a small outfit, it comes from a remote region the teas of which I haven't encountered before, and that area is itself interesting. In this case, the area is Matai, which (i) sounds like a cocktail, and (ii) is somewhere between Mengku and Bangdong*. 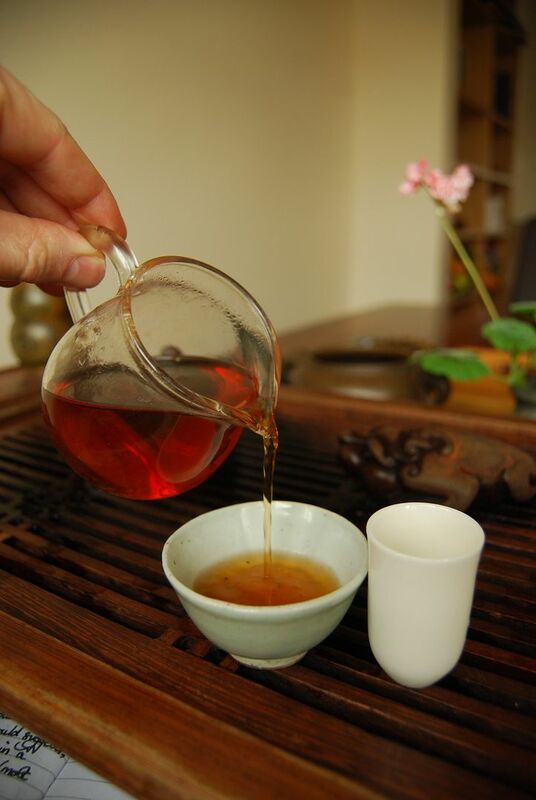 This makes it a Lincang cake, which is always welcome at my tea-table. The brand is "Mapu", where the first character refers to Matai, and the last to the name of the farm owner: Pujinjing. William of Bannacha notes that her name is Bulang minority, and hence may not be decomposed into SURNAME + GIVEN_NAME. Even at 4.30 a.m., before the March sun has risen, this cake emits a very decent aroma. I find that the cold weather (we had snow yesterday) prevents aroma escaping the leaves, but this cake is a notable exception that proves the rule. The compression is E-Z (which I stubbornly pronounce "ee-zed"), and, as you can tell above, the leaves are reasonably small. This "Guyun" [Ancient Harmony/Rhyme/Charm] cake is the more brutal of a pair - naturally, it is my first choice. 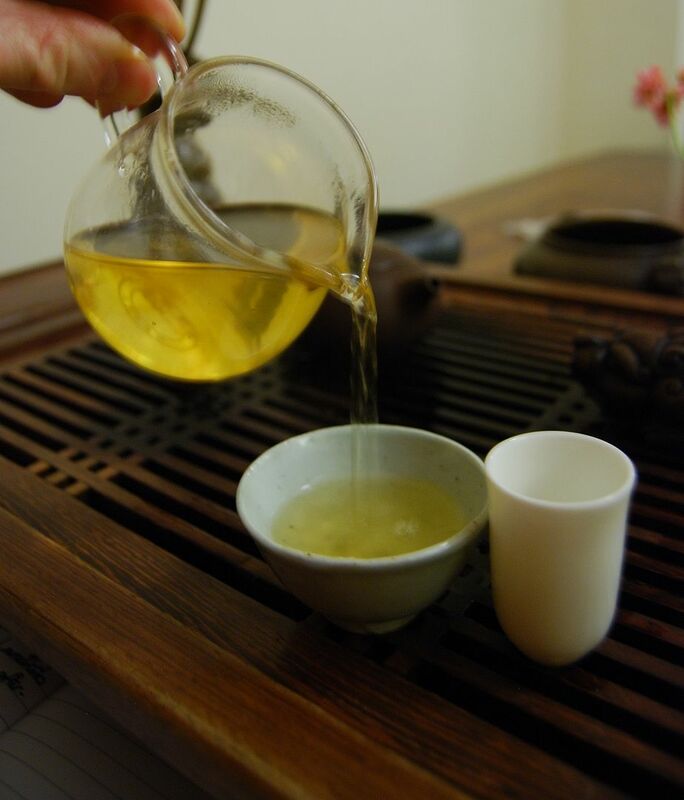 The vivid yellow soup, pictured below, has a powerful, buttery scent that lasts well and which reminds me of young cakes from Essence of Tea and Yunnan Sourcing. 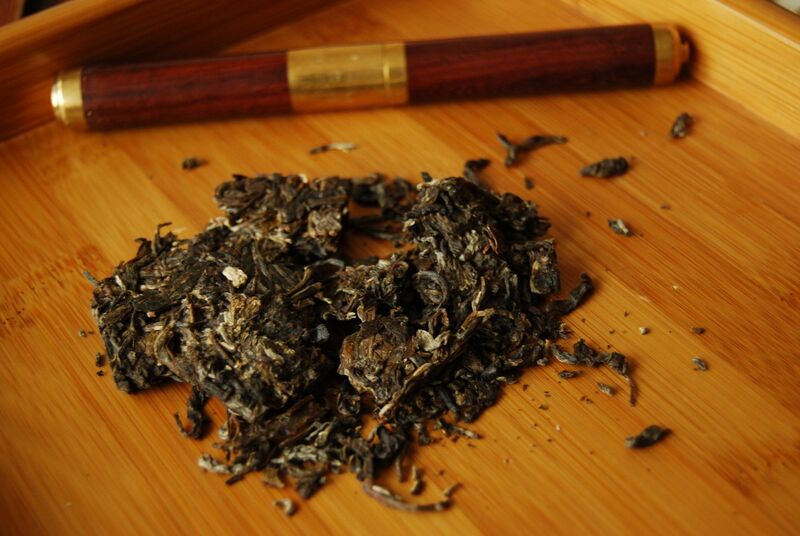 It has a really rather delicious flavour of long grass and pollen, immensely succulent and provoking shengjin [mouth-watering sensations]. 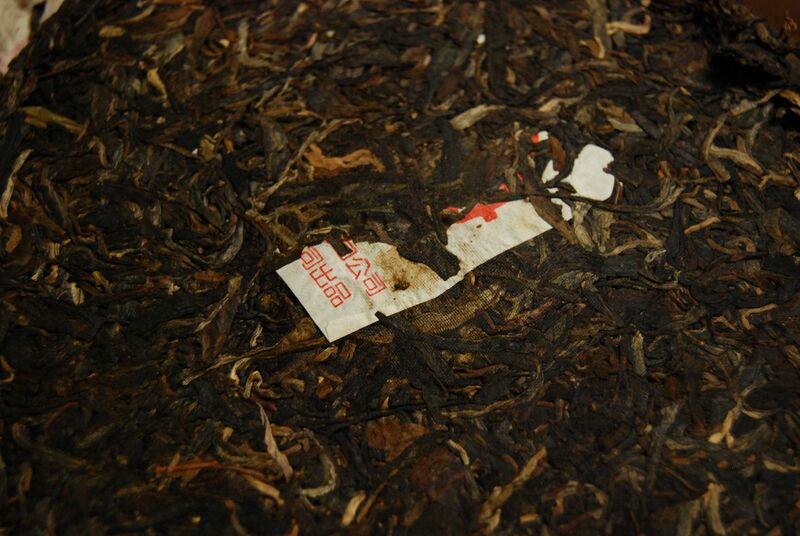 Happily, the thickness of the body and the sheer quantity of contents in the initial infusions turns out to last very well. 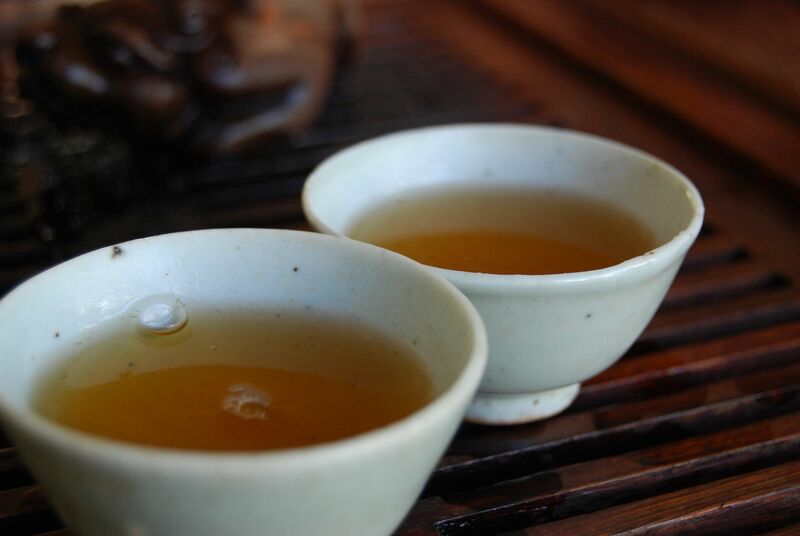 I continue to drink the tea throughout the day in laboratory, albeit the drinker in a rather tired state, and it stays solid and fat throughout. I enjoyed this perky, fullsome Lincang cake very much, and felt the urge to order a cake immediately. At just 35 Euro (45 USD), it punches way above its weight. One has to be careful buying cakes with tons of floral character - this is often the first thing to disappear after a few years. 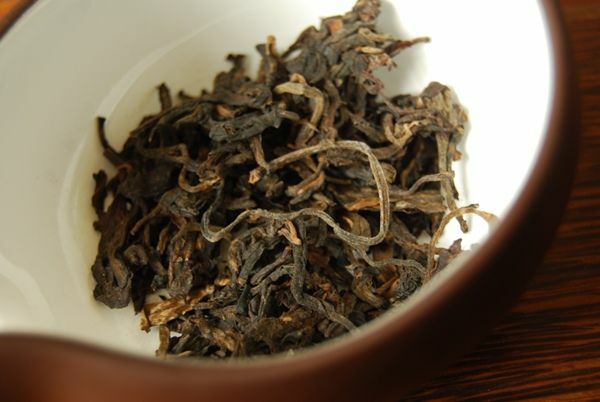 However, the massively chunky base of this tea suggests that, even without its pollenated high-notes, it has the sheer solidity to age quite well. Its heavy kuwei [good bitterness in the throat] lasts very well, provokes all manner of excellent sensations in the mouth, and reminds me that good tea does not have to cost the Earth. Highly recommended, if you like big Lincang cakes. 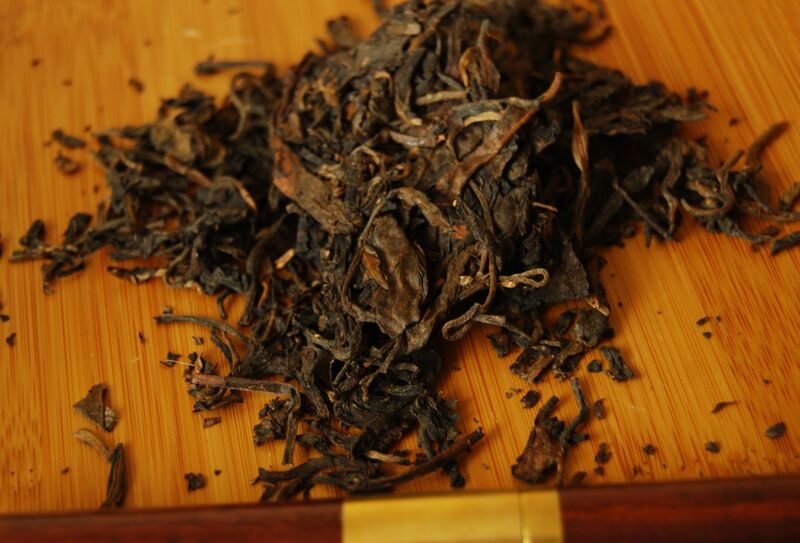 2004 Junkyfactory "Shicang", 2012 Zhengjian "Cangyan Gufeng"
This Cangyan Gefeng [ANCIENT STYLE!] 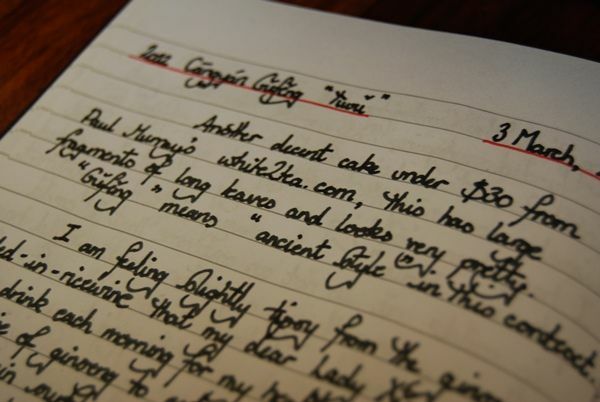 cake, made by an outfit named "Zhengjian" looks great. It has long leaves, pictured below, and makes me very expectant of Good Things. Everything seems right: strength of aroma, depth and endurance of scent, appearance and strength of leaves. The photograph below actually makes me thirsty again. 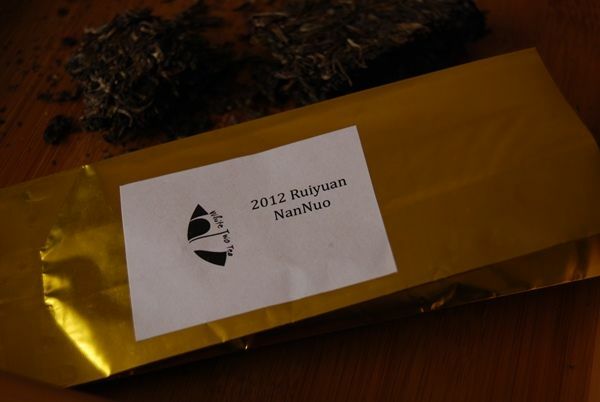 I happen to be drinking the 2012 Ruiyuan as I write this, and consequently wince in welcome agony. The compression is that "hand-pressed" level that suggests some poor soul has been moving heavy pieces of stone around. Following his pursuance of all things bargain, twodog2 offers this cake for under 30 units of American currency. This is one of those cakes that really reminds you not to make snap judgements: if I may be frank, it starts off excellent and then its glory rapidly diminishes as its base of taidicha begins to make itself felt. 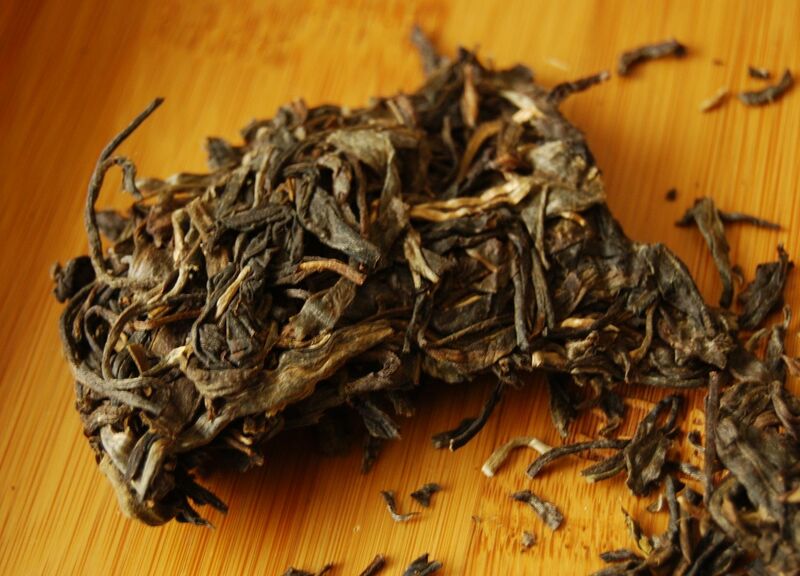 It is definitely Yiwu, and has all the good characteristics for which one would hope: purity and density of sweetness, decent throatiness, a minor huigan. The body is moderately robust and the light kuwei [good bitterness] seems quite enjoyable. Underneath, however, the base of thick, green leaves lurks like the white whale beneath the surface. By the time of the fifth infusion, the whale has surfaced and is busy making light of your harpoons. It is a struggle, and not one that I enjoyed excessively, due to its baseness and roughness. I seem to remember being extremely tired when I tried this cake, and consequently was unimpressed by its surliness. JUNKYFACTORY, however, seemed to be an entirely different kettle of aquatic craniates. I do so loves me my rancid, damp, humid darkness, and this cake has all of that and more. I don't know if I'd say that it was "wet stored", from just the leaves - perhaps more "stored in a very hot and humid environment". 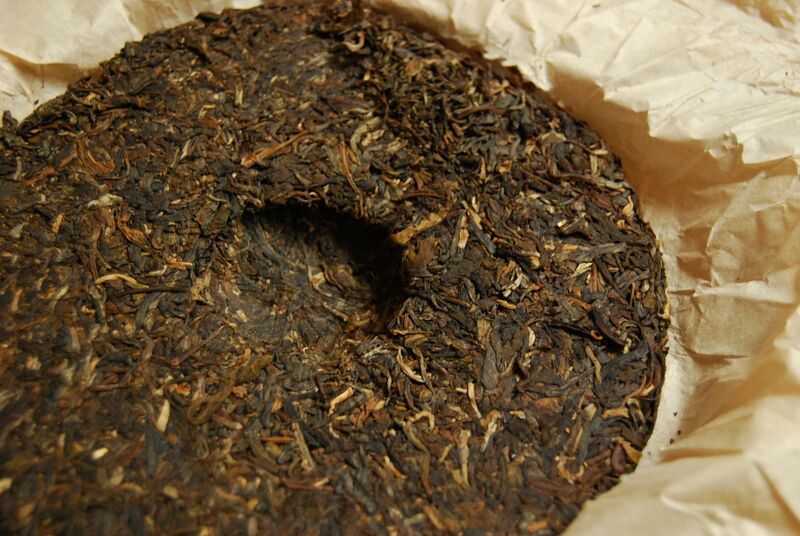 It is the architypical Hong Kong / Singapore cake, with its flinty, mineral sweetness. It didn't turn the corner into being "wet", for me. Bring it on! 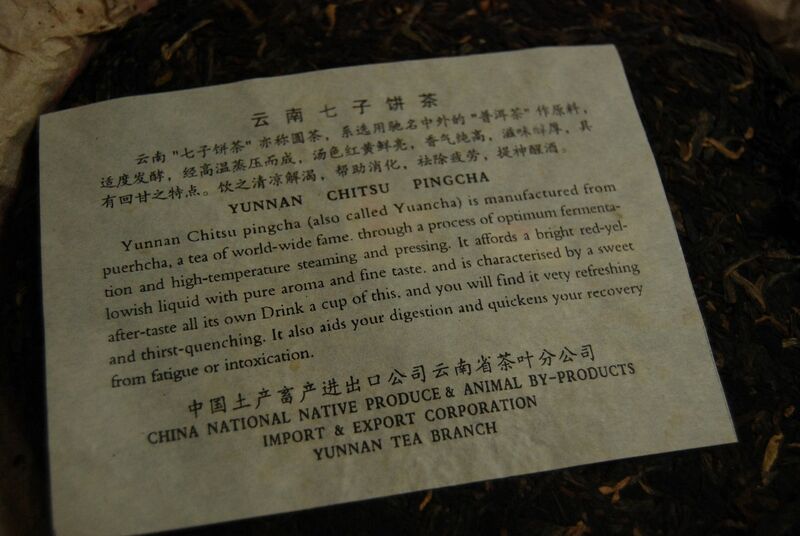 Delicious, humid, macabre characteristics abound, which make me very glad to be at the tea-table. 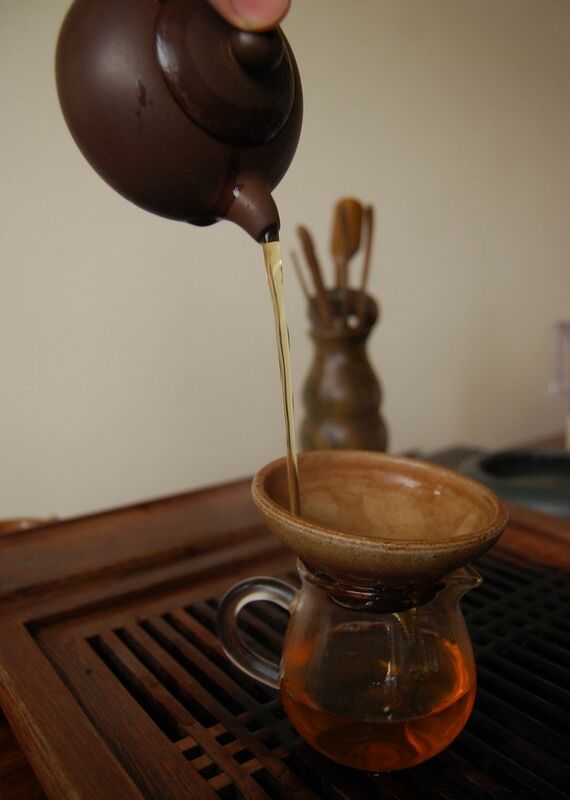 It washes away the green abrasion of the Cangyan Gufeng and reminds me that everything is going to be OK, after all. The colour of the soup pictured above tells you everything you need to know about this cake from the famous JUNKYFACTORY. It is completely stereotypical, and entirely delicious. It probably cost around 20 RMB when it was new, and has aged into something fine. By fine, I mean evil. Sweet, long, powdery, humid, eternally throaty. 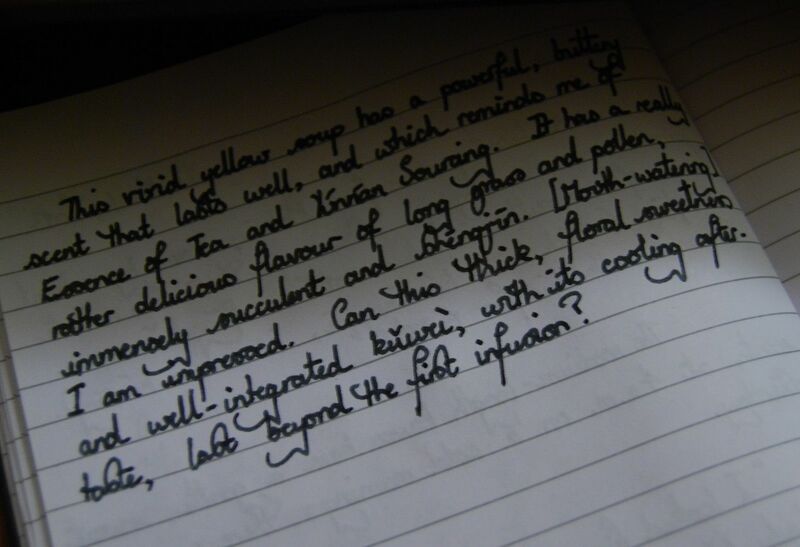 I drink this for a good hour or so, filling up pages of my diary with my latest blatherings. 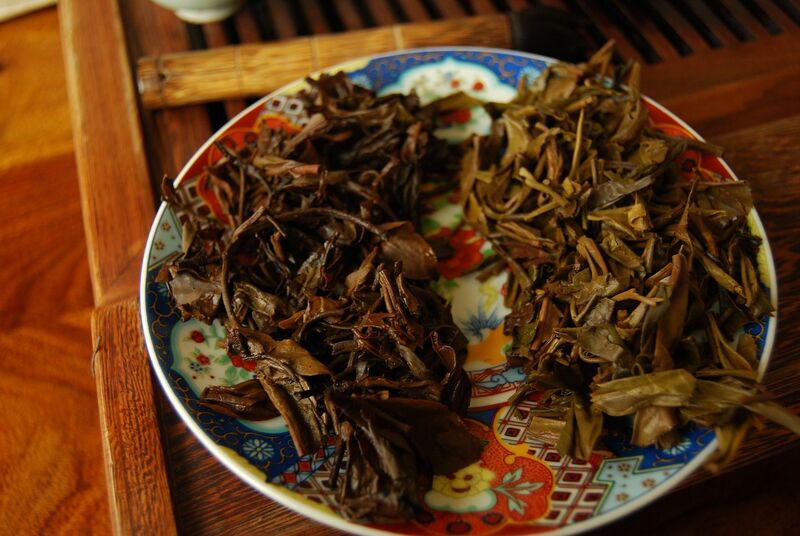 The above compares JUNKYFACTORY and the Cangyan Gefeng, and I will let you decide which is which. Note the presence of some really rather long, well-preserved leaves in the former. Marvellous stuff. Cheap (I assume) and exceptionally cheerful. 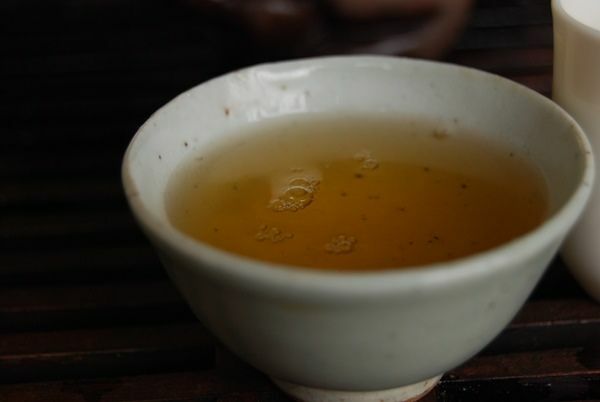 It reminds me of the 2006 Tiandiren "Bulang" that I drink most days in my lab, but with more humidity. The Dayi 501 tuocha is a thing of humble beauty. Just click that link and marvel at its deliciousness. According to my notes, I originally bought them at $10 / 250g from Yunnan Sourcing. Ten! Dollars! They now seem to be unavailable, and the next best thing via Taobaowang is the 502 (i.e., the second batch in 2005). 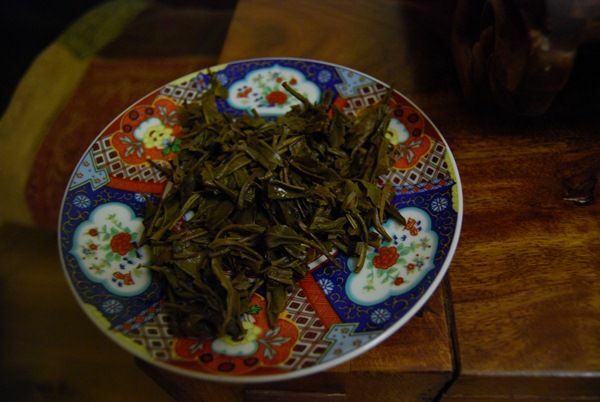 This latter currently sells for 350 RMB ($56) for a whopping 500g tuocha. The mighty Apache and I have recently enjoyed a session with this "sample A" version of 502. 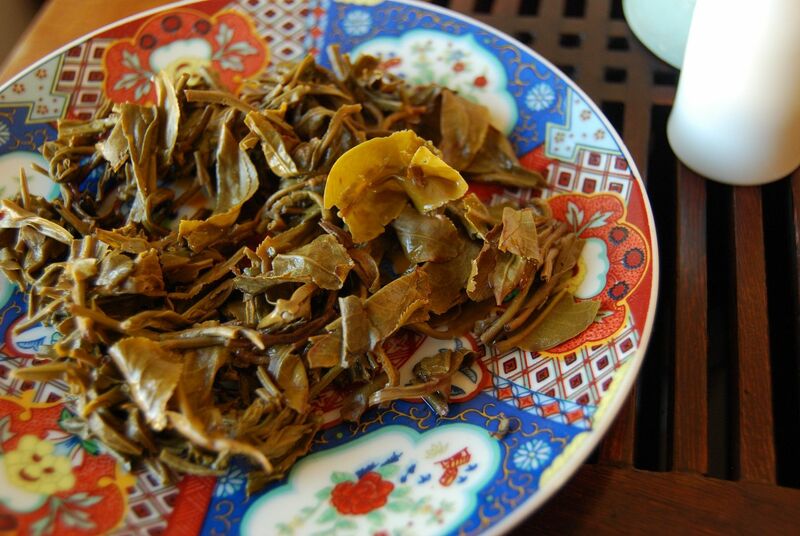 The leaves, below, look as we might expect for a good tuocha: fragmented and small, highly compressed, but looking otherwise appealing with their lustrous shine. The soup is orange, and indicates that the 8 (!) 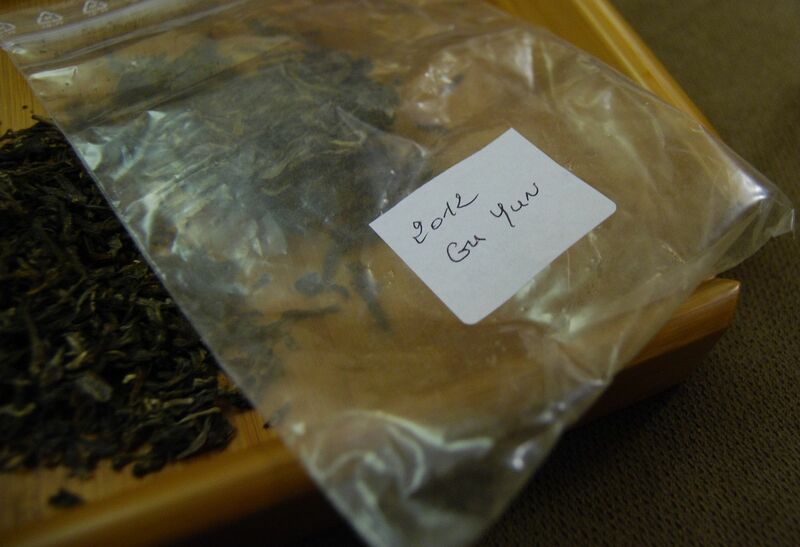 years since 2005 have been working on the tea. 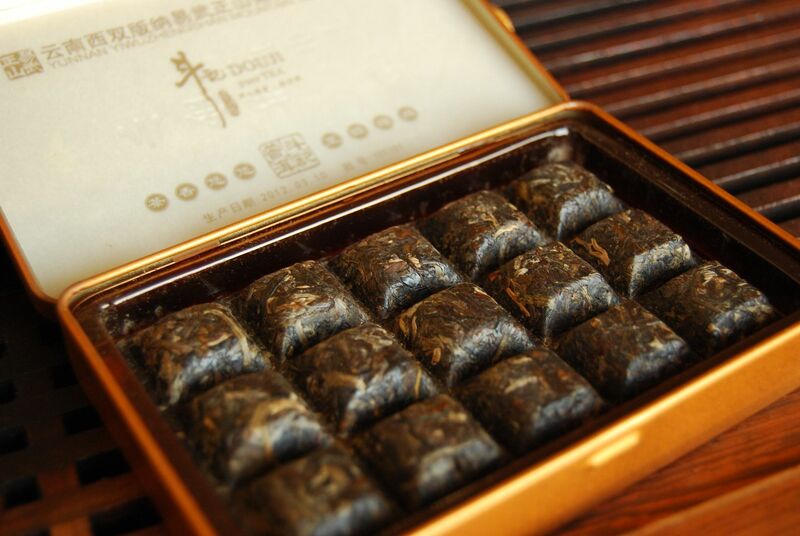 It has a long, dark, and sweet aroma in the wenxiangbei that indicates power and decent contents. It certainly has not slumbered. Immediately obvious is the forthright and tangy finish, followed by a late kuwei, which stays in the throat and under the tongue. 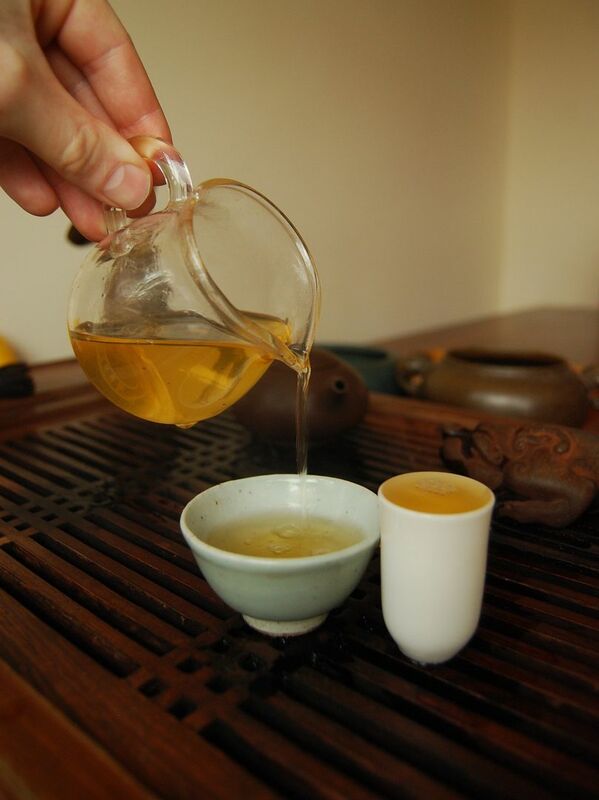 The long aftertaste is accompanied by a pronounced cooling sensation on the breath. 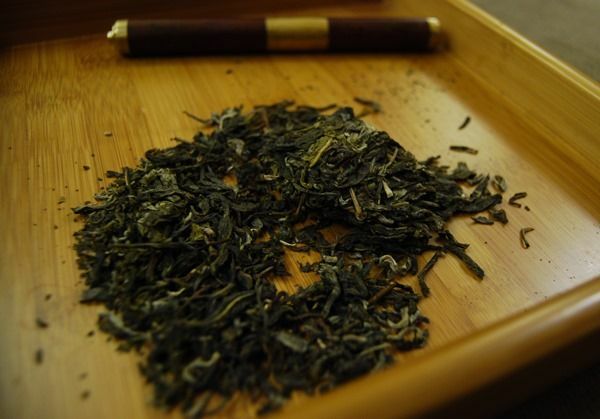 In the first infusion, a "fishy" flavour that rapidly dissipates - akin to a Japanese green. It lasts a very long time, and remains stable: it is solid, simple, tangy, and particularly mouth-watering, with the spicy wood characteristics of good leaves undergoing good storage. It is a satisfying tuocha, and certainly as enjoyable as my much-loved 501. 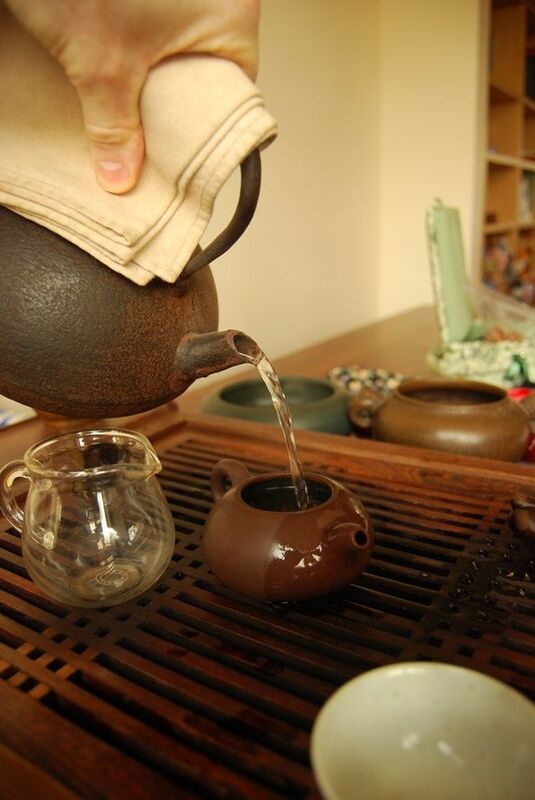 Remember that this is humble tea, and so to have such a good session is a real testament to the ability of Dayi cakes to age well. For comparison, we have "sample B", which is, if I understand correctly, the tuocha that is currently available via Taobaowang. 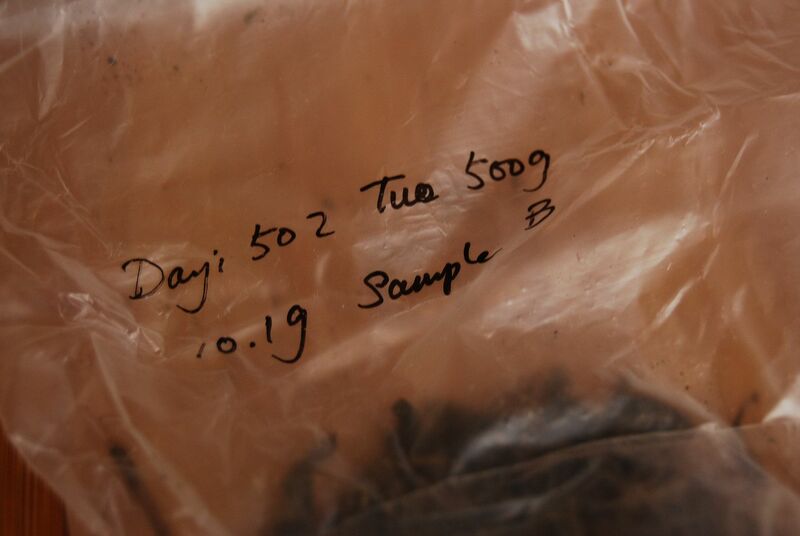 It certainly looks to be the same tea, and it will be an interesting experiment to see if both 502s have aged identically. To expel any doubt that this is the same tea as sample "A", it even has the same "fishy" opening, which, as with the other sample, dissipates after the first infusion. The comparison is fascinating: sample "B" is lighter, requires long infusion times, and does not fill the mouth as well as did "A". It is clean and very dry. While it has the same overall profile as the first sample, this second version has clearly been the result of a much drier storage, which is confirmed by Apache. I wonder if "B" has been stored somewhere like Beijing for a few years - it is noticeably different to "A", and, it must be said, a little less satisfying. My own 501 is closer to the "A" profile in character. It is good to be cautious when buying from Taobaowang, given the variety of storage conditions, and I am grateful to Apache for allowing me to keep track of his on-going investigation. 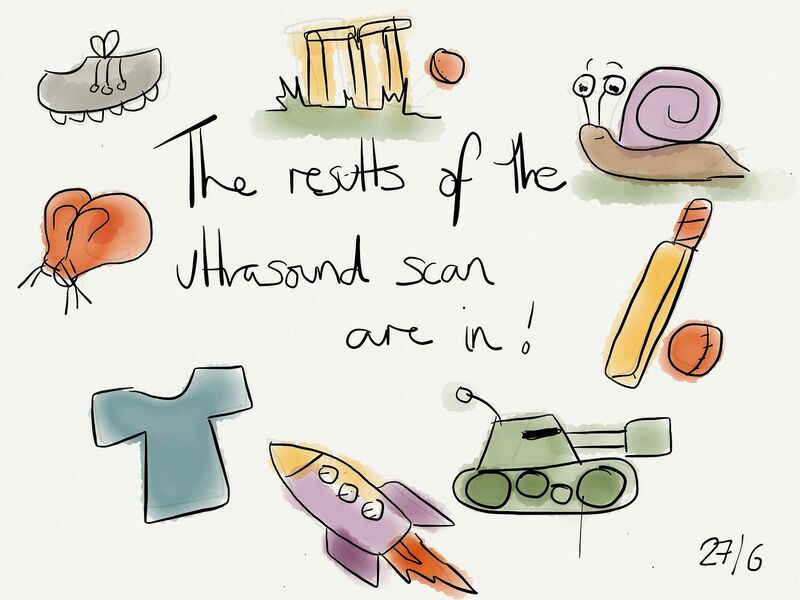 Today's comparison again emphasised the importance of getting one's storage right, given that the outcome can be so obviously different.